1. Game of Thrones stars, Kit Harington (Jon Snow) and Emilia Clarke (Daenerys Targaryen), filmed the new Dolce & Gabbana commercials for "The One" fragrance on the streets of Naples (Napoli). 2. 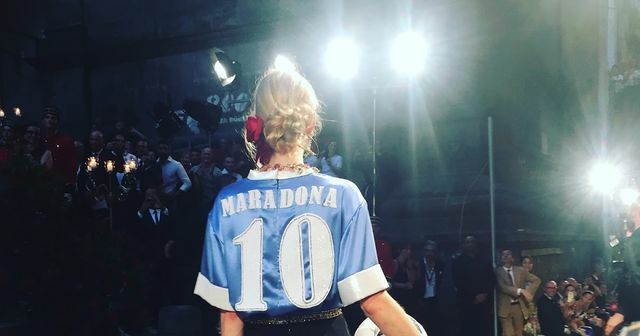 Dolce & Gabbana's Autumn 2016 Alta Moda collection, also staged on the streets of Naples, featured a blue and white silk football shirt with "MARADONA 10" embroidered on the back and “NAPOLI” on the front as a tribute to Argentinian football legend, Diego Maradona who played for Napoli football club. 3. Maradona has sued Dolce & Gabbana in Milan earlier this month for the misappropriation of his name (which is registered as a trade mark in the EU) without permission. The shirt also featured the name "SOPHIA" on the front as a nod to Sophia Loren who was the muse of that collection and the one who suggested her hometown of Naples as the setting of the collection. She was seated on a throne at the show as the models sashayed passed on the cobblestone streets. Perhaps things would have turned out differently had Maradona been invited to and had his own throne at the show. The MARADONA shirt had not been produced for sale which means that any claim for damages will be limited. We await the outcome of this fracas though perhaps not with the same anticipation as Games of Thrones Season 8. A few days ago a number of newspapers (mostly in Italian and Spanish) reported that former Argentinean footballer Diego Armando Maradona has sued Italian fashion house Dolce&Gabbana. The reason?